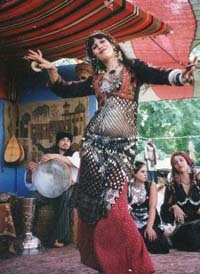 My introduction to belly dancing was through a high school pal Rebaba (Habi Ru). Her insistence was that I "Come to class, its really fun." Two bus lines led to a small studio in San Franciscos Pacific Heights. 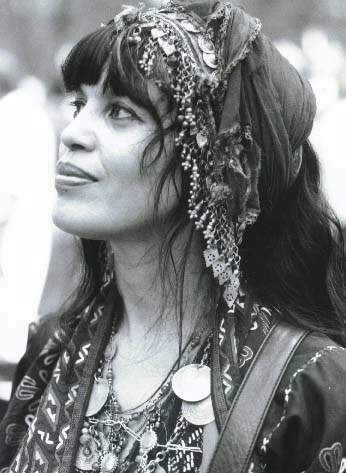 Opening the door was a different world of girls and women wearing Bedouin jewelry, pantaloons, scarves, two deep in a circle at whose center was Jamila Salimpor. After 2 years apprenticeship I joined her Bal Anat Dance Troupe, featured at the Northern California Renaissance Faire, playing finger cymbals and holding the banner until Jamila gave me the name Karma and made me one of the pink ladies doing an undulation dance. Our mentor was Katrina Borda whose specialty was the bicycle step down to the ground, rising upright again like a goddess. Jamilas insistence on learning the fundamentals, including finger cymbals and carefully researched costuming was a major contrast to other teachers of the time, many of whom just made things up, according to some bizarre Hollywood/metaphysical hippie fantasy. In 1972 I turned professional, starting out Monday nights at Broadways (San Francisco) Baghdad Cabaret to the virtuoso oud playing of George Elias, and later his brother Jad. Three shows a night with two other dancers to live music was the best training possible, I was hooked. With the Casbah two doors down, and the Greek Taverna around the corner, San Francisco was a wonderful opportunity to learn Arabic music and dance. What shaped my dancing indelibly was dancing for Middle Eastern audiences and picking up steps and hand movements from people . Coming to Southern California in the early 80s, Hollywood was a Mecca of clubs that featured live music and dancers. In San Francisco the band usually consisted of dumbek, oud or violin, flute, and a singer. When I was at the Sahara in Hollywood, the music was a 9 piece orchestra, two famous Lebanese singers, and a Persian acrobatic troupe! Sahara catered to Saudis, and tips were showered over performers heads, so much so that a man with a silver tray stood by the stage to sweep up the paper money so you wouldnt slip and fall. The shows would change about every 2 months, and I had the opportunity of working at Khayam, Ali Babas, KoKos and on nights off there was the Fez, Cabaret Tehran, and many more going 7 nights a week. After work all the dancers and musicians had breakfast at Darwish in East LA and after eating, the jam session would start. At 3 in the am we still wanted to play music and dance for ourselves. The scene at that time was very friendly, maybe because there were plenty of jobs. As the club scene slowed, I began to get work in films, and music videos, as varied as George Clinton, Cypress Hill, appearing in General Hospital, and Night Court, as well as starting to teach. More recently after reconnecting with the talented drummer Salah Takesh and Joskun Tamer (the creator of the Middle Eastern Dance Camp) I performed to the wonderful Turkish music of Anatolia at the eclectic West Hollywood club, Luna Park for 4 years, as well as playing finger cymbals with them on Santa Monicas KCRW radio station. Through Joshkun I met the wonderful musician Omar Faruk Tekbilek and his sweet wife and one of my favorite dancers, Suzi. They have honored my home with many great musical parties. Last year E Channels Fashion Emergency showed a piece on my transition from dancer to entrepreneur of my jewelry line. I had no idea all that time ago how much of an affect the Dance would have on my life. Of course I wouldnt have changed a thing.